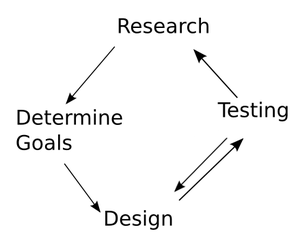 Design as a Structured Process? I have a Love/Hate relationship with design method frameworks, these diagrams and flows showing what happens afters which step in a design process: »Human Centered Design« or »Design Thinking« to name two. A major problem of prototyping in code is that the prototype may be mistaken for a (nearly) finished product and that the focus shifts from the interactions towards colors and fonts. Audio-Recordings of Interviews: Indispensable or Nice Supplement? Reading in the literature on Interviewing almost everybody recommends audio recording as well as additional video. Nevertheless I wondered how important these recordings might be especially considering that some people never learn to value a user centered design process if they find their first steps too tedious. Brainstorming is a rather well known Method for generating ideas. The participants generate as many as possibly ideas without judging the ideas. Since Osborn introduced it in his work »Applied Imagination« it is in use and its rather popular  and part of the design thinking approach .